Are you tired of those neighbors of yours sticking their nose in your business? Maybe you have a large dog who likes to jump over your chain link fence. Or maybe you just want to improve the curb appeal of your home. Whatever the reason you want a Privacy Fence, Hercules Fence of Manassas, Virginia is here for you. 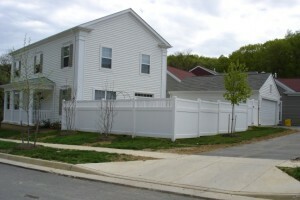 Hercules Fence has been providing professional privacy fence installation in Manassas since 1955. We are the largest fence company based in Northern Virginia, allowing us to buy our fencing products at a price that will afford you value to complement our quality. Hercules Fence can handle all of your fencing needs. There are two primary styles of privacy fence: wood and vinyl. Each has its own set of benefits. Wood Privacy Fence: These fences provide a natural, rustic look to complement your home. They are also easily changed – painted or stained – to match your ever changing sense of style. The primary drawback of a woof privacy fence is maintenance. These fences need to be cleaned, painted/stained annually. Vinyl Privacy Fence: A vinyl fence may cost a little more than its wood counterpart, but, for some, the low maintenance is well worth the initial investment. Hercules Fence installs both wood and vinyl privacy fences throughout Northern Virginia. Please take a moment to browse our many other residential fence offerings, including Ornamental Steel Fences, Chain Link Fences, and Ornamental Aluminum Fences. What is the number one benefit of a privacy fence? You guess it…privacy! But you probably figured that out before this blog. A privacy fence is also great for keeping your children or pets safe, while also keeping intruders and wild animals out. Both wood and vinyl fences are a great way to add curb appeal and home value. A privacy fence will also help cut down on the wind and noise pollution in your backyard. Finally, privacy fences are built to last. If you have any questions about a Privacy Fence for your Manassas Home, please contact Hercules Fence of Northern Virginia today by calling (703) 551-2609 or visiting our website. Also, check out Hercules Fence of Manassas on Facebook, Twitter, Google+ and YouTube! This entry was posted on Wednesday, March 19th, 2014 at 6:19 pm. Both comments and pings are currently closed.